For those unable to attend painter Josh Smith’s Graduate Art Seminar last month, we’ve got your back. Adam Stamp, who is currently pursuing an MFA through Art Center’s Graduate Art program, has provided an insightful and informed essay about Smith’s irreverent body of work and his wide-ranging talk full of valuable takeaways for emerging young artists. In January, artist Josh Smith visited Art Center to speak at the Graduate Art Seminar lecture series. Smith is one of the 13 artists featured in The Forever Now, a controversial painting show at MoMA, described by many critics with the rhetoric du jour as the first survey of zombieism, with many considering Smith to be the prime example. 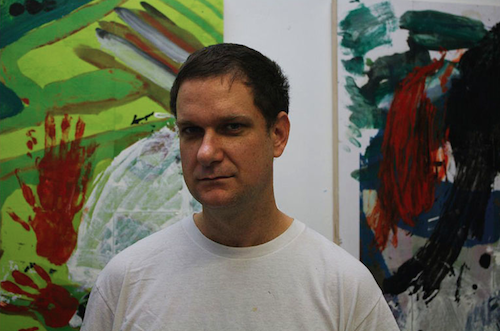 The artist who made a name for himself with his “name paintings”, a series of works that continue to this day where he uses his name (literally the letter J-O-S-H S-M-I-T-H) as the subject of his paintings, was described in 2013 by New York Times critic Roberta Smith as “sacrosanct and trashy.” His newest works to make waves depict black palm tree silhouettes in front of Technicolor sky-scapes, á la Edvard Munch.